For many self-employed dentists, buying their own dental practice is a dream, the ultimate career goal. However, it is also a journey riddled with pitfalls, risk and uncertainty. 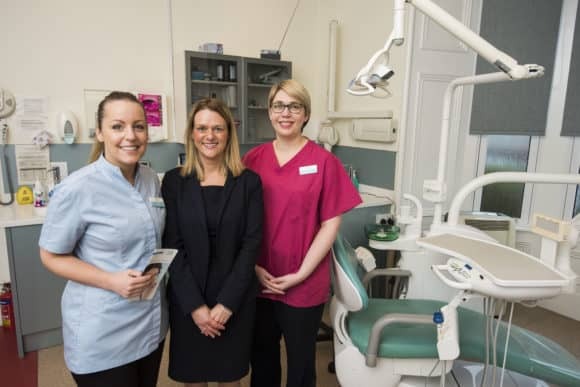 For dentists and University of Dundee graduates Jane Clyne and Eleanor Ferguson, the onset of a new year marks the start of their second full year owning Broughty Ferry Dental Care, Dundee, having bought the business in August 2016. In that time, the practice has expanded, with two additional dentists appointed and staff numbers increasing from 13 to 18. Jane and Eleanor are also currently building another surgery within the practice. Of course, behind any successful business is a supportive team of financial and business advisors. Already trusting EQ Chartered Accountants in Dundee with her tax affairs, Jane, previously an Associate with the practice, was keen to explore the feasibility of buying the premises with her friend Eleanor, an Associate with another practice in Angus. Keen to get the ball rolling, the pair began talks with EQ Partner and Head of Healthcare team Louise Grant. With the company’s portfolio of dental clients doubling in the past 12 months, the team has secured over £3.2million of finance for dental practices, allowing new dental associates to realise their dreams of owning their own practice. Louise went on to work with Jane and Eleanor on the valuation, funding application and subsequent purchase of the business, as well as all operational matters once the purchase was made. Jane said, “Making the transition from a self-employed dentist to a business owner is a huge step. However, EQ really understand the minutia of the sector we operate in, which can be very complicated and challenging. EQ’s wealth of experience in dental circles allowed us to visualise our dream more clearly, to see that it was possible. They supported us throughout, from the early planning stages through to having the business valued and all aspects of the purchase. “We didn’t expect the level of assistance which we received, particularly when it came to putting us in touch with solicitors, banks and financial advisors who also understood the dental sector, giving us a variety of options and advice along the way on everything from pensions to employee contracts. For more information on how EQ Healthcare can turn your dreams into reality, contact our Healthcare specialists via healthcare@eqaccountants.co.uk, visit www.eqaccountants.co.uk or call our offices. For more information about Broughty Ferry Dental Care, telephone (01382) 477562.